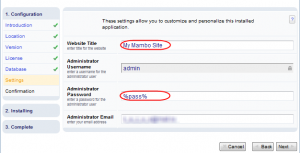 We hope, you remember us posting an article, where two hosting control panels – cPanel and DirectAdmin were brought face to face. 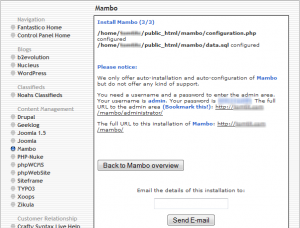 Well, if you do, you may find it interesting to learn the peculiarities of automatic script installers provided by those panels – Fantastico DeLuxe and Installatron. Nowadays there is no need in downloading the source code of the needed software or web application to have it setup on the server. Compilations, failed installations and post-setup debugging are not needed anymore – everyone uses webhosting script installers now, saving time and becoming able to build their sites off-hand. Needless to say, a professionally coded powerful script can make any website look way more attractive. Additional options and tools, offered by the scripts, help small business websites grow into big projects, and personal websites – grow into a community with a large number of visitors. It is really hard to believe that all this can be done with just a couple of clicks. 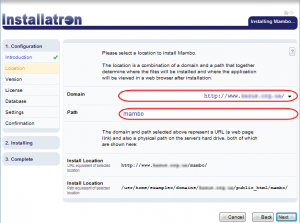 Let us take a closer look at both cPanel Fantastico and Installatron tools, provided with DirectAdmin hosting. 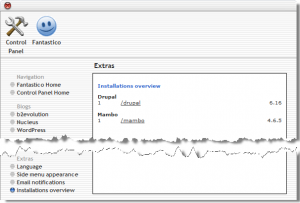 Fantastico installer is a really quick tool. It stores only one version of the needed software – the latest; sets up the database and its user on the fly and is fast about the update or removal of scripts. 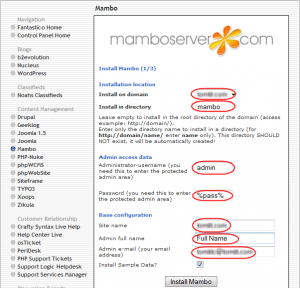 Choosing a cPanel host, you should keep in mind that Fantastico is an addon, which means that not all hosting companies can provide it along with their packages. 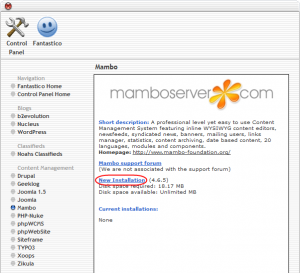 Before we proceed with detailed description and comparison of both tools, please check the categories and scripts that are offered by Fantastico DeLuxe on their official website. 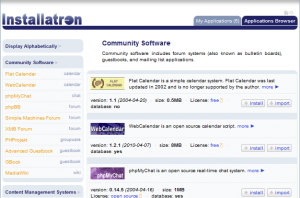 If you need a detailed description of what and when is happening on your server, Installatron is definitely the right choice for you. This software reports any step it is going to make and although it takes more time for script installation/removal to be carried out, such option may be useful, especially for newbies. 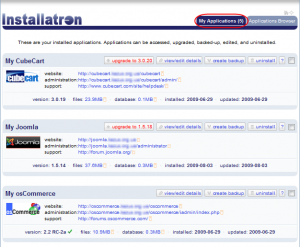 Installatron scripts can be checked out at their developers’ webpage. 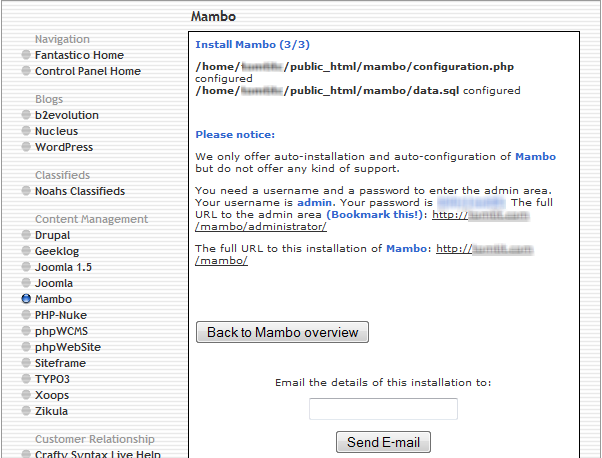 Meanwhile we will move on and compare both installers in action. 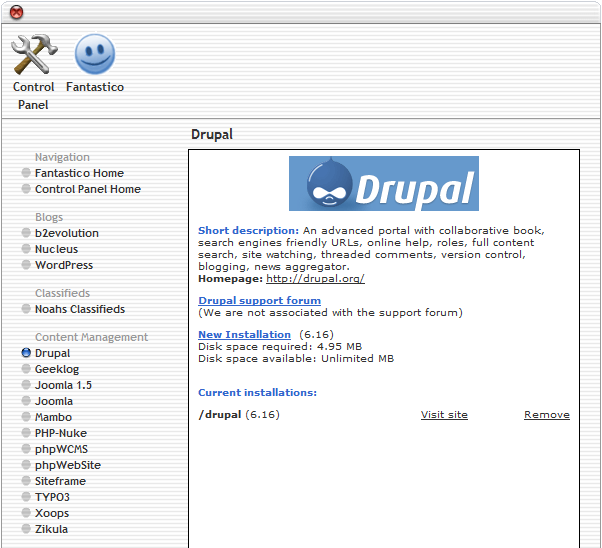 As you might have already noticed, both tools provide almost same scripts. If categorizing, those scripts may be distinguished as blogs, forums, content management systems (CMS), galleries, and e-commerce tools. Such groups are sorted in both installers to the left with right side left for software features description. 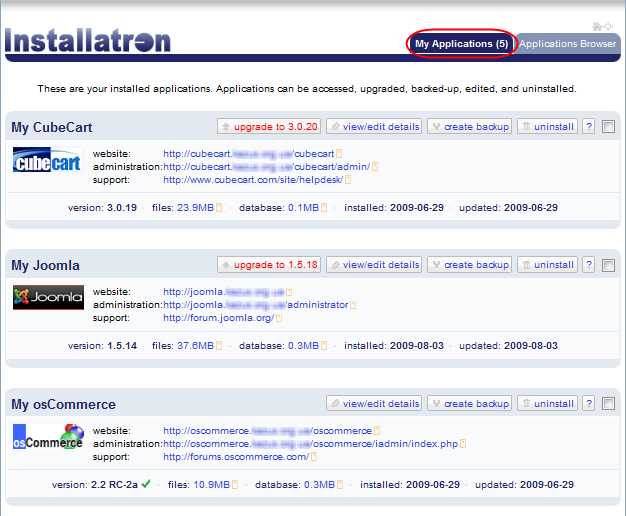 This, of course, doesn’t grant Installatron an “Epic Win”. Sure, it is convenient for comparison of different tools of the same type, but most users already know exactly what they want to install by the time they start installation. Let’s say we know what we are going to install and passed all the steps using both installers. 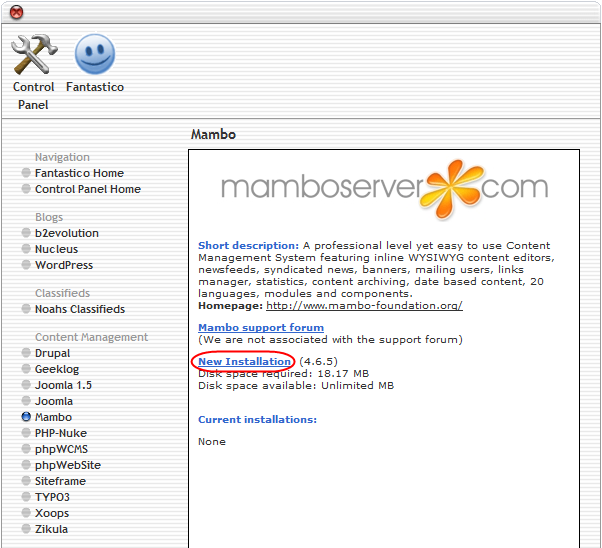 Installation with Fantastico is a prompt 3-step action. 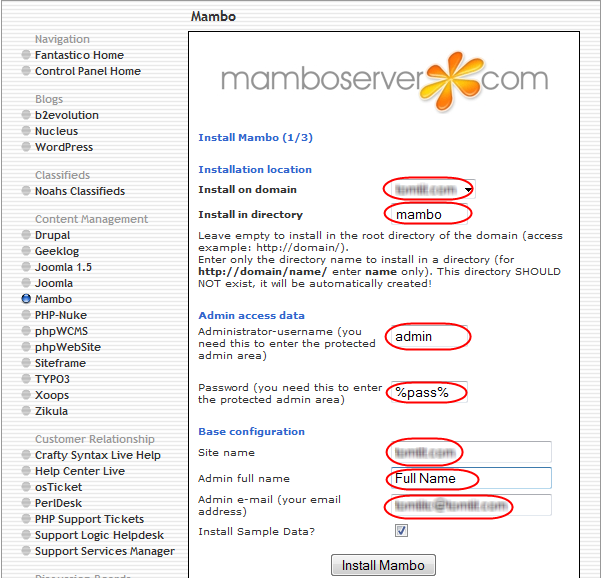 2 – You choose the directory for the installation; provide access and administrator’s data. 3 – You finish the installation. Database and user are setup automatically. 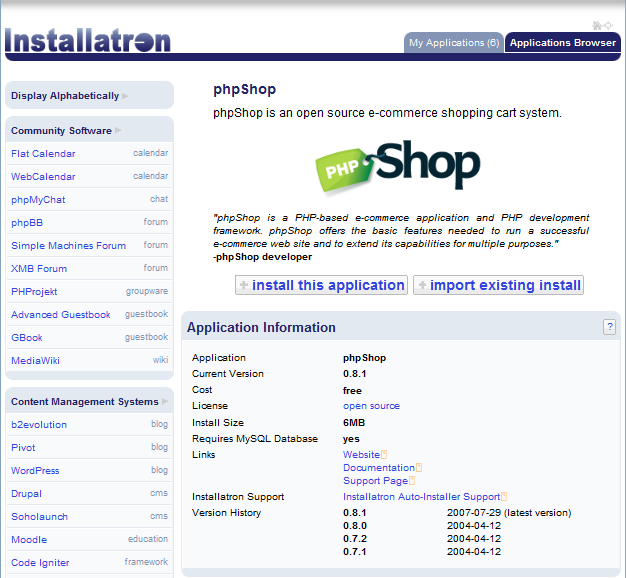 Installatron seems to be having more questions to ask you. 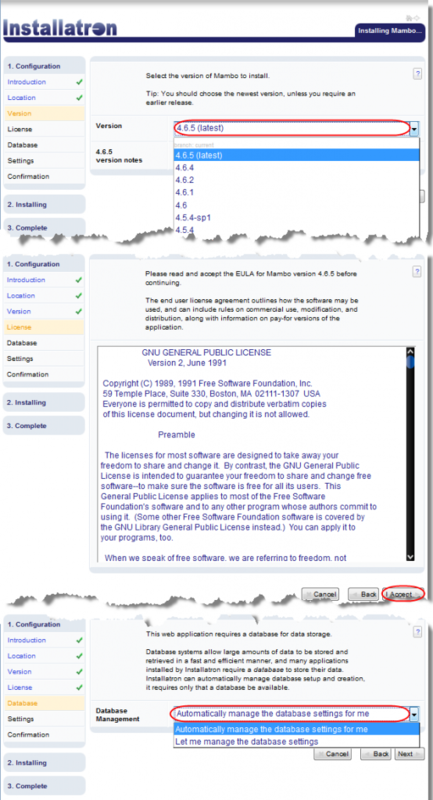 Beside choosing the installation directory and providing access data in two different steps, you will need to choose the software version (not a bad idea actually, if your server has some restrictions or outdated software), the database creation way (automatic/manual) and… agree with the license. 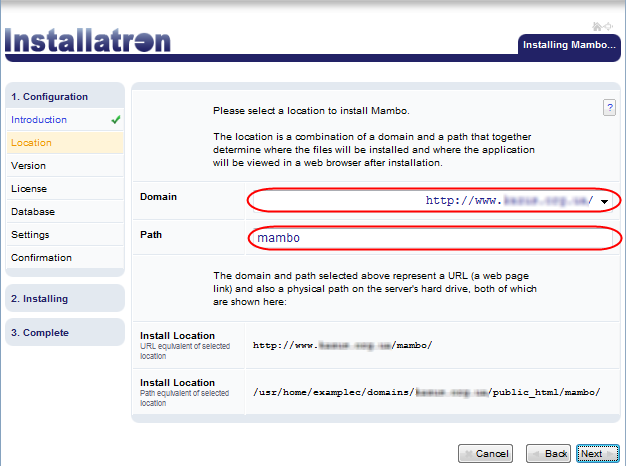 Once the script is setup, Installatron provides installation summary the same way Fantastico does. 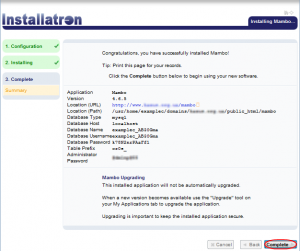 You can view existing installation in both tools, but Installatron allows you to make it easier than Fantastico, whose developers moved the needed button to the very bottom. If you haven’t chosen your control panel yet, this comparative article might help you to make the right choice. 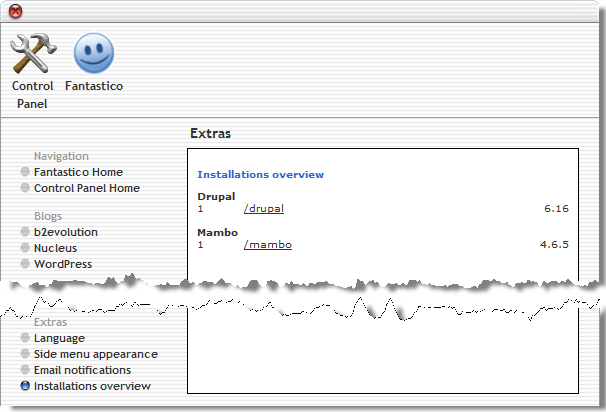 It is obvious, that Fantastico is designed for those, who know what to do and how to do it. 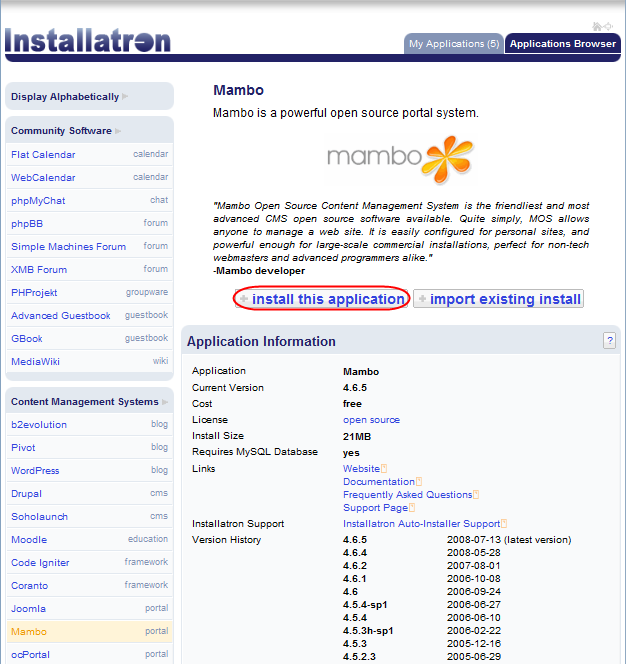 Such users use installers just to speed up their work – after that they do everything on their own. 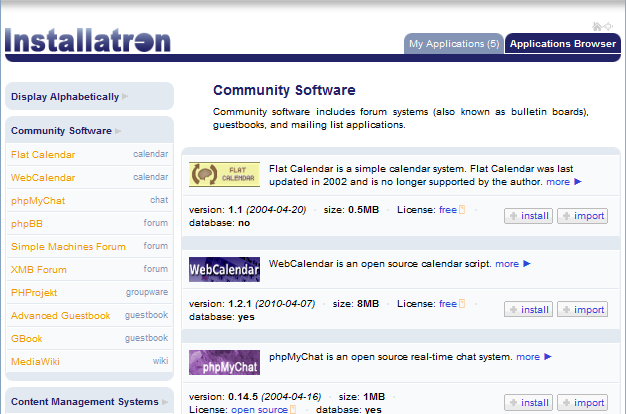 Installatron users may feel more comfortable, as there’s more care taken of them both during software setup and after it – more tips, more support options which is very useful. An experienced user, however, may consider it a time waste, especially if administering dozens of account, which require a separate script to be installed under each addon or subdomain. To make the long story short we may say that both script installers are going to be a perfect addon to your control panel. 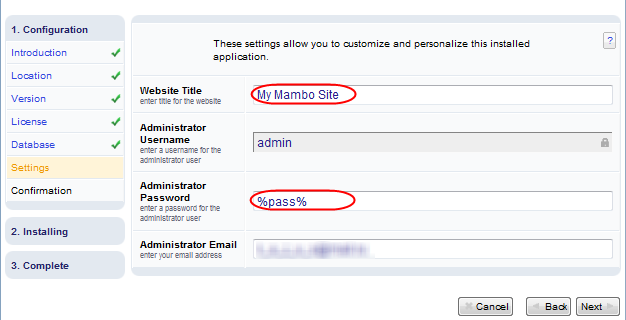 If you are an administrator of a multi-account (domain) infrastructure – you should definitely consider Fantastico. 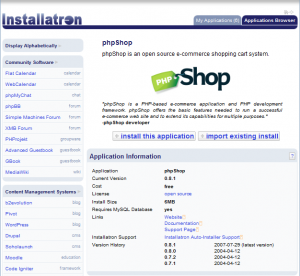 If you are planning to run your personal website or a small business project – Installatron is more likely to fit your needs. If you are sure what you are going to host and already know the platform you would like to host it on, you may have a look at our shared hosting plans at SiteValley.com.